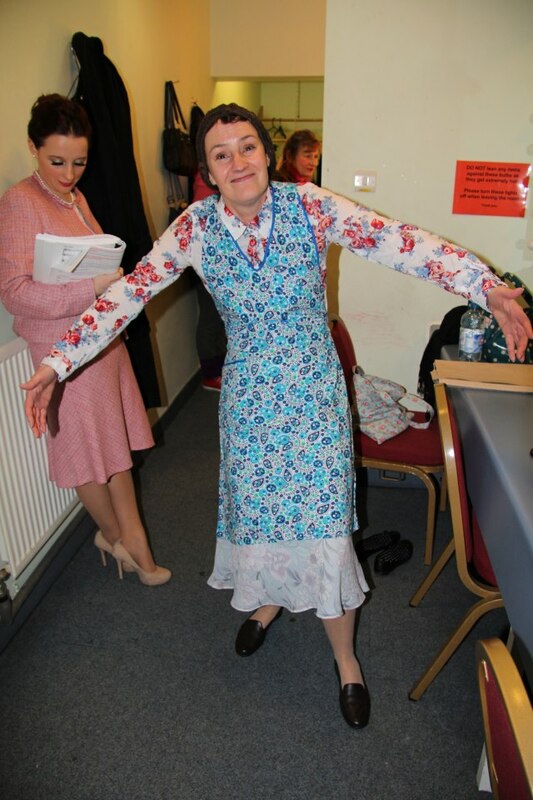 Mrs Overall recently took to the stage at the South Holland Centre, Spalding, with other members of the cast of SADOS’ Acorn Antiques as part of an evening of entertainment with the Rotary Club. We performed a 10 minute segment of the show which included a little bit of dialogue and my solo, Macaroons. As you can see in the photo, I look bloody lovely in my pinny, flat granny shoes and hairnet. The things we do for our art, darling. Dougie and Rory were visibly shocked when they saw me dressed in this outfit but reassured me I looked the part. Considering we don’t actually perform the full show until the middle of May, it was quite a risk to take a snippet of the play, which we have only really ‘blocked’ at the moment, and allow the public to see what we hope to offer in a couple of months time. We had no set, we couldn’t explain to the audience who the characters were and where exactly we were in the proceedings, but hopefully we gave them a flavour of what to expect in the real production. Our director managed to video our performance from the balcony and I have a clip of part of it which includes my singing. From my point of view, it was a really useful thing to do. I can now see that I am not projecting my voice anywhere near as loud as it needs to be. I’m pleased with the song, though, and it’s reassuring to know I can get to the end of it without collapsing. For anyone not familiar with Acorn Antiques, this was a sketch show written by Victoria Wood in the 1980s: a pastiche of poor soap operas, hence dodgy sets and props and rather obvious, stylised characters who miss lines and overact. It was made into a musical in 2005. Wow…well done! you are really really good with a great voice and do the stance and the accent really well. I've worked hard at the stance and the accent. At first I thought she was just hunched but then realised it was all in the knees! The arms were important to get right too. I've been studying Julie Walters very carefully. That's just what I say to myself. I've had lots of roles in the past where I'm far more glamorous but when I'm doing this part I don't give a monkey's what I look like. It's such a hoot to do – and comedy singing is far less stressful! You really are very, very good indeed! And the Oscar for Best Actress goes to…..
Shall I gush or just cry…or trip up the stairs? Hee hee! Now those shorts would bring the house down! I'm really impressed by the stance but also by how well the song is like mrs overall but still in tune! Actually I'm just impressed BUT dreadful language Mrs B! Dreadful! Apologies for the swearing but it does feel very liberating shouting out the F word like that! Move over Meryl…..a Star is Born! You are FABULOUS and totally wasted on your day job, quite obviously. Treading the boards so suits you, Modam! Well as I haven't much of a day job, which consists of some secretarial work at home for the Doc and voluntary work, then you can see why I throw myself into this. Have had a great rehearsal tonight – tap dancing was involved! I think it's going to be a good show. The cast have such a giggle in rehearsals so hopefully the audience will enjoy it too. Very impressive performance. You've got the natural flowing movements going so on stage you look as though you're comfortable to be there, no awkward static moments or anything. I'm having such a good time with it. It's been great to study the movements and appreciate that in the musical Julie Walters has lighter, quicker movements than she did in the original TV series. The Mrs Overall part is a cracker but the little snippet here doesn't show the solo parts the others have – Miss Babs and Berta have some great songs to sing and a character called Tony, who isn't in this clip, and who was played by Neil Morrissey in the West End version, is a good one too. But no-one else gets to swear like a trooper! Julie Walters may need to hand over a few Baftas to you, brilliant portrayal of the veritable Mrs O. You're too kind. It's a relief to know I'm heading in the right direction. Just have the rest of the show to learn now! I've always said you'd make a lovely scrubber…!